I'm posting them here for your Turkey Day enjoyment. 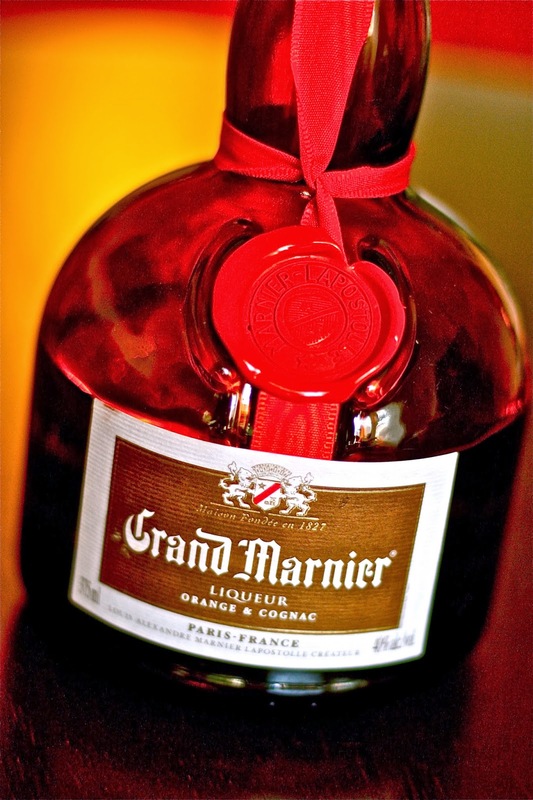 If you've never had Grand Marnier, it's fantastic. It's an orange liqueur that's been around since 1880, blending true cognacs and distilled essence of bitter orange. (I used it in my Grand Mimosa back in C week as well.) It's a great flavor addition to cranberries and sweet potatoes. (And don't worry, the alcohol cooks out during the baking process :)). But rest assured, I've made both of these recipes for the past three Thanksgivings, and every time they are met with rave reviews. So if you're on the lookout for cranberry sauce or sweet potato recipes, then give these a try. They have been tested and perfected, and I post them here with confidence. First up: the cranberry sauce. This could not be easier, and you can make them up to three days in advance so all you have to do is pull them out of the refrigerator when it's time to eat. Empty a 12 ounce package of cranberries into a square baker. (Can double this recipe if needed). Sprinkle with sugar, orange zest, Grand Marnier, and a few grates of a fresh cinnamon stick. Cover tightly with foil and place on a baking sheet (in case it spills over). Bake in the oven for about an hour. Remove from the oven, stir, and allow to cool. Refrigerate until you are ready to serve, at least 3 hours. (Can be made up to three days ahead of time). Now for the sweet potatoes. This is a recipe I adapted from my mom's sorority friend, Lil Leslie. The original recipe called for rum and A LOT of sugar. I found it to be too sweet, so I have tweaked this recipe over the last couple years and have come up with this combination. It is similar to ones you'll find elsewhere on the internet, but the main difference is I use maple syrup instead of sugar and a little touch of vanilla. I think it's a great compliment to the sweet potatoes with rich fall flavors for your Thanksgiving feast. (However, feel free to add some sugar if you have a sweet tooth :)). Definitely use fresh sweet potatoes (garnet yams), and cook them with your method of choice. (I prefer to roast them in the oven for about an hour until easily pierced with a fork). Once they've cooled, you can peel them and mash them. Combine with the rest of the ingredients (minus the topping) in a bowl and stir until everything is well incorporated. Spoon into a greased casserole dish. (Do ahead step: can keep in fridge overnight and remove about 30 minutes before baking and sprinkle with topping). For the topping, combine brown sugar, flour, pecans, and butter. Sprinkle over the top of sweet potatoes. Bake for 30 minutes at 350 degrees. Mmmmmm. It's almost like eating dessert. Happy Thanksgiving! Place cranberries in a square glass baking dish. Sprinkle with sugar, then orange zest, Grand Marnier, and a few grates of a fresh cinnamon stick. Cover tightly with foil and place on a baking sheet (in case it spills over). Bake in the oven for about an hour. Remove from the oven, stir, and allow to cool. Refrigerate until you are ready to serve, at least 3 hours. (Make ahead directions: Can be made up to three days ahead of time and store covered in refrigerator). Combine everything except topping ingredients in a medium bowl and stir until everything is well incorporated. Spoon into a greased casserole dish. For the topping, combine brown sugar, flour, pecans and butter. Sprinkle over the top of sweet potatoes. Bake for 30 minutes. I am going to try these Sweet Potatoes. I usually make mine with orange juice concentrate, pecans & marshmallows and a buncha stuff, but I think it's time for something new! I love Grand Marnier! Thanks for the idea! You're welcome! Let me know how they turn out. And of course, feel free to add the sugar if you like 'em sweeter. :)Happy Thanksgiving! This recipe sounds delicious. I am going to make these. Thank you so much! Happy Gobble Gobble to you!